A highly decorative 1603 map of the Azores by Abraham Ortelius. 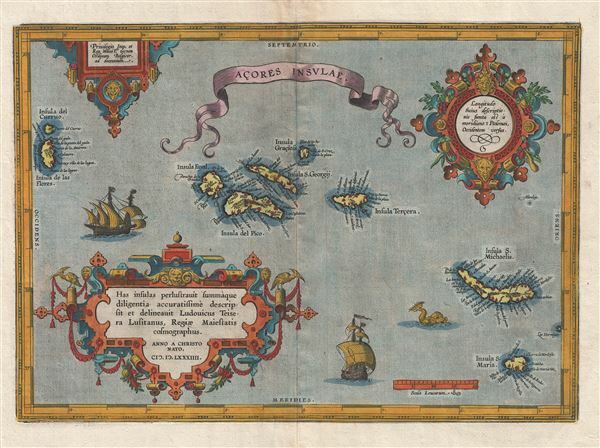 The map covers the Azores in considerable detail with numerous ships decorating the seas and a large sea serpent just west of St. Michael. The detail and overall beauty of Ortelius' map is reflective of the importance of the Azores to 16th and 17th century navigators. Columbus stopped, and was briefly imprisoned, here on his first voyage of discovery to the Americas. Other navigators followed his example until the islands became a major resupply point on the Spanish Galleon routes to and from the New World. Ortelius derived this map from Luis Teixeira's single sheet map of Terceira from 1582, which bears Ortelius' name and of which Meurer mentions one copy at the Biblioteque Nationale in Paris (Meurer p. 253-254). This map first appeared in the 1584 Latin edition of the Theatrum Orbis Terrarum. There are three known states, the present example being the third state, issued in 300 copies for the 1603 Latin Edition of the Theatrum. Ortelius, A., Theatrum Orbis Terrarum, (Amsterdam) Latin Edition, 1603. Very good. Minor wormholing restricted to margins. Blank on verso. Wide clean margins. Original platemark. Ort 24 (Koeman/Meurer: 95, Karrow: 1/136, van der Krogt AN: 6350:31), 1604L15.